Modern-Shed is excited to announce a new partnership with Peninsula Credit Union, a Western Washington-based financial institution that works closely with its members to meet their needs. For the first time in Modern-Shed’s history, financial loans will be made available through Peninsula Credit Union to finance the purchase of a Modern-Shed. 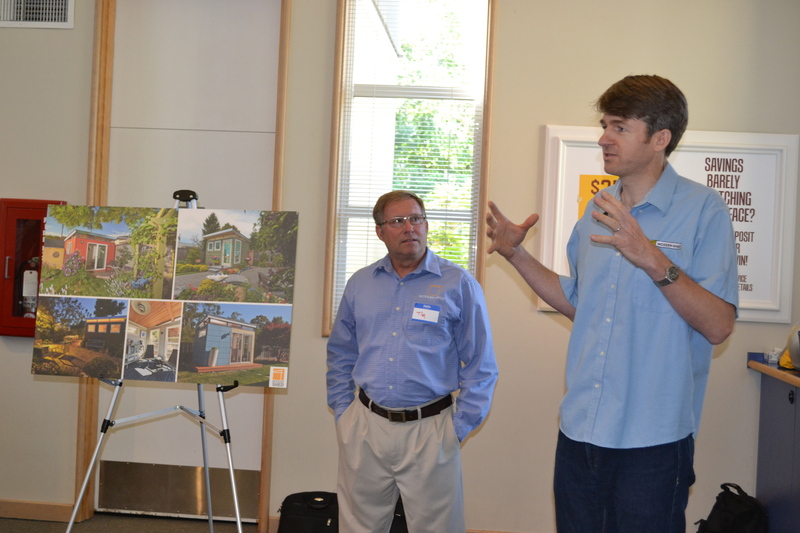 Modern-Shed General Manager Tim Vack and owner Ryan Smith discuss the possibilities for a Modern-Shed at a Peninsula Credit Union event. Jim Morrell, president and CEO of Peninsula Credit Union, said the new partnership developed organically, through conversations in the Mason County community, where Peninsula Credit Union is based. For more information on Peninsula Credit Union, visit www.pcfcu.org or speak with Modern-Shed dealer Jeff Bergerson at 360-789-7822. Next > What in the world is prefab?